Yesterday, Thursday 30th July 2015, has been a real step forwards in the #OpenDefra accelerator project work. We have spent the past month or so working out how we are going to approach delivering the Secretary of State’s ambitious Open Data commitment by next June. What we have done so far is put in place a team of experts from across Defra with different skills and experiences relevant to data. We have developed a high level explanation of what Defra needs to do over the next year, using the approach fostered by GDS over the last few years. In tackling each of these, and the other barriers we are looking at implementing a minimum viable approach which minimizes any risks to an appropriate level (unlikely to be 0) and is quick to deliver. This is challenging and we recognise that there is a large cultural shift that we will all need to meet to succeed in embedding change in the longer term and to also realise our commitment to being both an #OpenDefra and a Data Driven Defra. This is going to be the focus of the next year, this is getting data out there for potential users to see, feel and use. This will not be samples but it will be real data delivered in an alpha manner. By that we mean it may well be a full static archive copy of databases we use for people to look at and use, to consider uses for it and to feedback to us on how they would like to see it sustained and delivered. This is an approach to change the focus and get data out to be used rather than waiting until it is a polished product. Out of the 8000 datasets we will learn which will be interesting to end users, currently we do not know – but we are looking forwards to finding out. We are also calling this stage the ‘data dump’, as this epitomizes the culture change we need to see across Defra to deliver the target. Not all of the data that we would release will be at this alpha stage, some of or data will be available in what many would recognise as a live service. 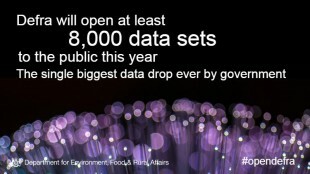 Part of the culture change in the first instance is to ensure that all of the data holders across Defra realize that the Secretary of State is relying on them to deliver. The accelerator project holds no data so can only shape the programme of work and help to deliver it. Fundamentally the delivery relies on those who have day to day control of the data. We have, up until now, used our expertise to decide what data should be shared and productized it to some degree – for example into specific extracts from a water quality database. This alpha phase will mean us fundamentally changing this approach, we will be getting the data out so that users can tell us what they want from the database rather than us assuming. We are not fixed to these but are using them as a starting point to help with our work. We spent some time yesterday looking at how we can engage with users across multiple themes to begin a conversation about what they want from us. Tom Smith, the independent chairman of the Environment Agency Data Advisory Group joined us yesterday to help us learn from the journey that the Environment Agency has taken over the past year, the role and benefits that users can bring to the debates around open data that are no doubt needed across Defra. He gave us a challenge too, to properly engage with all the prospective users of Defra data would probably mean an advisory group of hundreds of people – even if they were each representing different user communities. So in order to explore this further we decided that we would investigate this further. We discussed how we could do this, and what topic area to start with. We think that we are going to focus on the coastal zone as a geography that crosses multiple policy themes and multiple areas of Defra. We are thinking about how we can begin a wider engagement with data users, data owners and those who may hold data or want our data but do not know it yet. The team has created a hackpad to explore these ideas. This was the meat of our discussions and working yesterday in the accelerator project team and will continue to be developed over the next few days and weeks.